Aces of Iron Productions, Inc.
9 September 2011 - Aces of Iron Releases First Female Pilot Qualified to Fly Your Plane! 30 October 2010 - Aces of Iron Re-Releases "Spike" in 1/5 Scale! 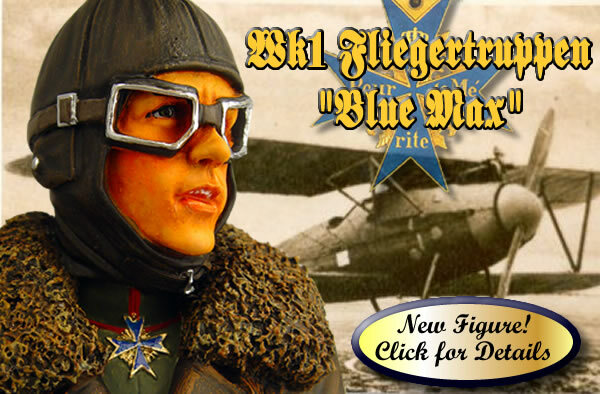 04 April 2008 - Aces of Iron Releases New WW1 Figure in 1/4, 1/5, 1/6 and 1/7 Scale! Aces of Iron has developed a new highly detailed figure for your 1/6 Warbird. This figure will soon be available in larger sizes as well. Click the banner below for more information. 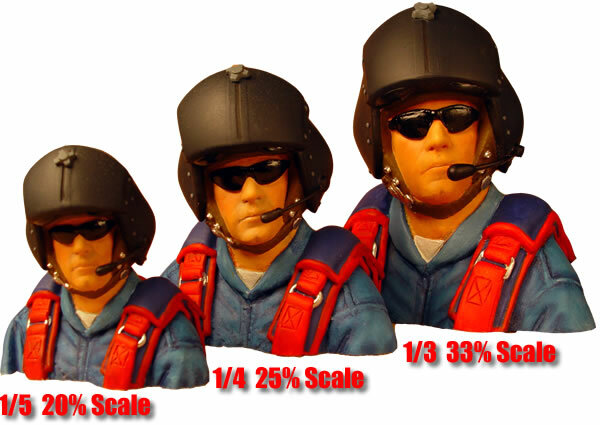 27 January 2008 - Aces of Iron Releases Civilian Sport Pilots Bust Only Designs in New Scales! Aces of Iron has developed the Civilian Design as cockpit fitting "Bust Only" form and has finished the 33% scale. This figure is perfect for all the aerobatic aircraft as well (YAKs, Edges, Extras, CAPs, Sukois, Pitts or ultimate Bipes). Click the banner below for more information. 10 February 2007 - Aces of Iron Pilots are Featured in film "Flyboys"! Aces of Iron Pilots are the only pilots with enough character to be a character! The newly released Collector's edition DVD of the movie "Flyboys" has a feature called "Diary of a Miniature Stunt Pilot". The feature is a behind the scenes look at the special effects models used in the film. The feature is narrated by none other than Aces of Iron's WW1 Generic pilot figure which they call "Buck". It turns out, "Buck" is the star used throughout the movie. You can see the feature on the DVD or watch it on YouTube Here. 5 February 2007 - New 1/3rd Scale Release! Aces of Iron has released its most popular figure in giant 1/3rd scale. This is the third design offered by Aces of Iron in 1/3rd scale. This figure is huge! The figure fits like a glove in the Balsa USA 1/3 scale Nieuport 28 or Fokker DVII. His thick flight coat can be painted canvas for US aviator or black leather for a German aviator. This variation is the most versatile of all the Dawn Patrol Series pilots. Click on the banner below for more Information. 1 September 2006 - Aces of Iron is Back! We have introduced several new figures: 3rd scale designs, a New German WW1, 3 New RFC designs and a Full-Body Display figure at 1/4 scale. All figures can now be purchased directly through this site. We offer a Paypal shopping cart that allows online ordering via credit card. We also have a printable order form which can be used for classic Mail-orders. We have added a link to our Ebay auctions where we sell discounted figures from our 'scratch and dent' inventory. We have streamlined the appearance of the site to allow you to browse with ease. 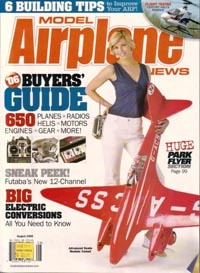 4 July 2006 - Aces of Iron Article in "Model Airplane News"! The August '06 issue of Model Airplane News features the first of a two part article written by us at Aces of Iron. 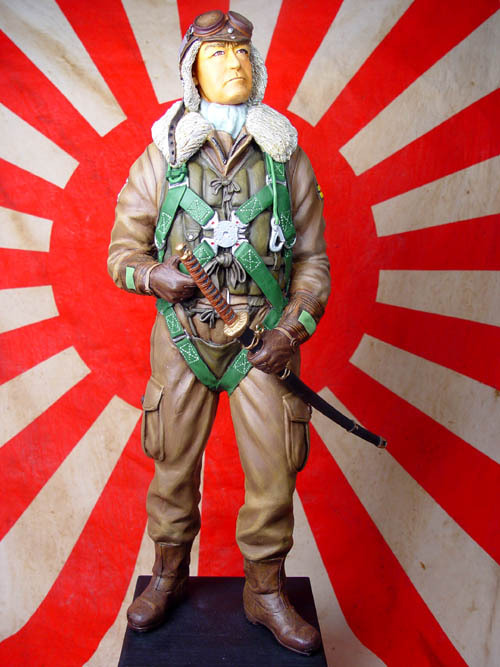 The Articles will provide step-by-step painting instructions for the Japanese pilot bust. The techniques described in the articles can be used to finish any of our figures. Both the August and September issues are available for sale now. 1 May 2006 - Aces of Iron Retooling! Aces of Iron has closed for the Flying season. Aces of Iron Products will no longer be sold through perfectpilots.com. Starting September 1st, Aces of Iron will start selling our products direct through this site. The ability to market our products direct will allow us the freedom to expand our product line. Scroll down to preview some of the new designs and Scales that will become available when we re-open to start the building season. In the interim, some designs may be available for sale on Ebay (use keyword "aces of iron"). Available September 1st, Our first 1/3rd scale Bust, Perfect for that BUSA DVII or GTM design. This design will also be available in 1/4 scale. 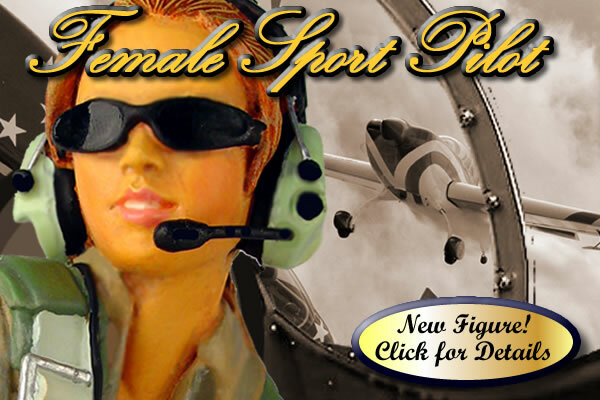 Available September 1st, 1/3rd scale Bust, Perfect for that BUSA Sopwith Pup or Monoplane. This design will also be available in 1/4 scale. at 18" This figure will be made to order complete with sword. Perfect for display on your flight line or Display case. All Text and Images Copyright © 2019 Aces of Iron Productions Inc.